We couldn’t let the NFL season pass without talking one last time to the NFL Network’s Mike Lombardi. We discussed the Super Bowl, what the Patriots should do during the offseason, whether Bill Belichick will retire, where Peyton Manning is headed, how the NFL draft is shaping up, and which team might be our 2012 sleeper. After that (40-minute mark), I called my buddy J-Bug to find out the mood in Boston after the brutal Patriots loss. Could the fans turn on Tom Brady? Are the Bruins really threatening to become Boston’s no. 1 team? 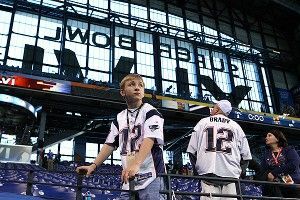 Should Patriots fans be a little more grateful about everything? If you ever wanted to hear a semi-broken guy with a Boston accent somehow put everything in perspective while talking in a crowded office at work, this is the conversation for you. I really need to call the J-Bug more often. You can find today’s podcast on the ESPN.com Podcenter or on iTunes.